Alabama, which could become a future NFL expansion team, is coming to Fayetteville this week to, ahem, “play” against the Razorbacks. Saturday would certainly have been a good time for some of that medical marijuana … could have rolled a tidy one. Who do you think will win the Heisman trophy this year? Dale Cullins: At this point, the early money has to be on Tua Tagovailoa from Alabama. The problem is that he may not actually play enough minutes to rack up the crazy numbers needed to stay on top of the voting. With that being said, I might go with Kyler Murray at Oklahoma. Will Grier at West Virginia is good, but his team will lose a few games, and lately that doesn’t win you the Heisman. Murray, on the other hand, has a better team around him, and the Sooners can score some points in the Big 12 that plays very little defense. David Rice: In the modern era, the Heisman typically goes to the best player on the best team. Without question, that player has been Alabama’s Tua Tagovailoa to this point of the season. Craig May: This is a name-your-score game for Alabama. Having said that, the Tide is going to be a double-digit favorite in all of their remaining regular season games. Let’s try to not get anyone hurt and move on to the next three games that seem to be more winnable. Alabama 45, Arkansas 10. Todd Rudisill: Sit back and enjoy watching the 2018 Heisman winner on Saturday. Tua is fun to watch. It’s hard to believe the last Razorback quarterback to defeat the mighty Crimson Tide was Mitch Mustain in 2006. Let that sink in for a moment. The Hogs have had back-to-back moral victories against Auburn and A&M, according to social media. The Hogs are ranked #3 in the Moral Victories poll but will jump to #1 if they stay within 30 points of the real number one team in the country. Scratch hammer down this week, and just get hammered before the game for this one. Bama wins 52-9. Dale Cullins: This is one of the games of the week in the SEC. I like Kentucky in this one. They handled Mississippi State last week like they were Alcorn State, and I didn’t see anything from A&M last week to make me think they are going to win more than 8 games this year. Kentucky plays solid defense, and can score some points. Call it KY 31, A&M 24. 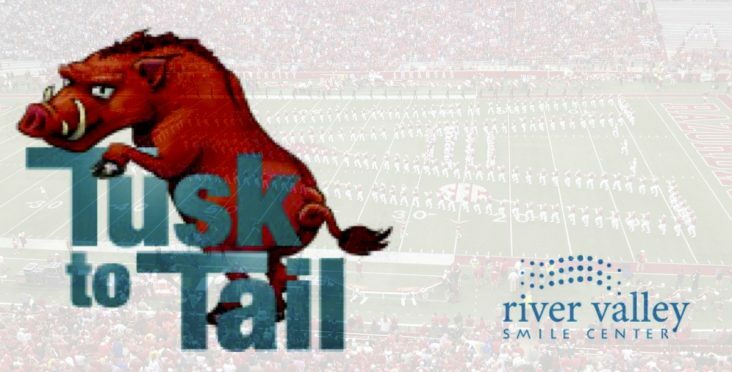 Todd Rudisill: Never in a million years would I think I would be excited to watch a Kentucky football game not involving Arkansas, but this is a big matchup. It is one of the most intriguing games of Week 6, at least in the SEC. Texas A&M leads the conference in time of possession, and that’s one thing the Wildcats must do to have a chance to win this game. Kentucky has a great running back in Benny Snell, but A&M has a run defense that leads the SEC, allowing only 85 yards a game. If they can do that Saturday, the Wildcats have no shot. UK gets some points, but not enough. Aggies take this one 31-24. Craig May: Mississippi State started the season hot with three non-conference wins, but struggled in losses to Kentucky and Florida. Now the Bulldogs face a stout Auburn defense. The Tigers’ running game has not been very good this season, and quarterback Jarrett Stidham has struggled with accuracy in the passing game. The defensive front for Auburn has been outstanding, ranked 8th in country in rush defense. Look for a low scoring game. Auburn 24, MSU 14. Mark Wagner: Other than dropping a heartbreaker to Maryland in the opener, Tom Herman has the Longhorns clicking. They have won their last 4 games. Meanwhile, Oklahoma is undefeated, so something has got to give. While Texas’ defense has been great against the run, the Sooner offense has a great passing attack with Kyler Murray, who has caused many Sooner fans to say Baker who? I just don’t think the Horns have faced an offense as good as the Sooners this year. This game is not going to disappoint. It’s going to be a great one to watch, and there may even be an upset. Oklahoma 25, Texas 27. David Rice: It seems like Notre Dame has more haters than most other teams. The haters better start preparing themselves to see the Fighting Irish in the playoffs. This is the last ranked team they will likely face before the postseason. Blacksburg, Virginia may be one of the most hostile environments in college football, but I think Notre Dame prevails, 28-20. Todd Rudisill: The Gators will make this game ugly like they have all year. Florida may not be fun to watch, but their defense is the real deal. They shut Mississippi State’s power offense down last week, and pulled off the W in Starkville. Joe Burrow has not thrown an interception this season, and has looked better than any recent LSU quarterback. I think he throws his first pick this week against this Gator D. The last four of these games have been decided by less than 7 points and there is no reason to think this one won’t be the same. Gators pull off the upset in The Swamp. 26-23.